Over the course of the last year or two, mirrorless interchangeable-lens camera systems have gone from being interesting portents of things to come to distinctly mainstream products. And with the likes of the Sony, Olympus, Panasonic and Samsung all building up their systems into very credible alternatives to DSLR outfits, Nikon has now decided the time has come to show its hand. The result is the 'Nikon 1' system, initially two cameras and four lenses (plus a smattering of accessories) built around a new sensor format that the company calls 'CX'. At 13.2 x 8.8mm in size, the 1 system's brand-new Nikon-designed CMOS sensor is about a third of the area of the DX sensor used in the company's mainstream SLRs. Initial attention has focused on the relatively small size of this sensor compared to other mirrorless systems, and this is a pity as it risks overlooking the impressive technology Nikon has designed into it. Not only is it capable of extraordinary shooting speeds (full resolution images can be captured at an astonishing 60 frames per second), it also incorporates a 'Hybrid' autofocus system that employs both Phase and Contrast Detection focus methods. The result is, according to Nikon, the fastest autofocus of any camera the company has ever made - including its professional flagship DSLR, the D3S. Not only that, the 1 system cameras can shoot at 10 frames per second while maintaining focus on a moving subject. The system can choose from 135 points when utilizing contrast-detection AF and 73 when using phase-detection AF, and will automatically select what it thinks is the most appropriate method. The camera's shooting speed is supported by an all-new image processor, branded as EXPEED 3. This allows the camera to achieve a remarkable data throughput of 600 MP/sec, which Nikon claims is the 'fastest in the world'. A slide at the press launch event graphically made this point - in terms of sheer data processing speed, the Nikon 1 system cameras outpace the D3S by a considerable margin. A slide from Nikon UK's launch presentation, illustrating the high-speed data throughput of the 1 system compared to other cameras on the market, including Nikon's own flagship D3X. This being 2011, the sensor also has serious video capabilities. It's capable of recording Full HD movies (1920 x 1080 resolution) at 60i or 30p, and full-resolution stills can be captured at a press of the shutter button without interrupting recording. This is the first camera we can think of that gives the user the choice of how the video output is packaged (60i and 30p are essentially the same data presented differently), depending on whether you want to just view the footage or edit it. The phase-detection AF system means the cameras can also track a moving subject during video shooting. All-in-all the 1 system represents an impressive convergance of stills and video capabilities into a single camera. Nikon 1 V1 vs J1 - What's the difference? J1 has built-in pop-up flash, while V1 has an accessory port in place of the pop-up flash, initially compatible with a tiny slide-on flash unit and GPS device, but with more accessories proposed to follow. J1 has only an electronic shutter, whereas the V1 has a mechanical shutter too. In principle this should afford better image quality to the V1 under certain conditions. It also helps the V1 achieve a flash sync speed of 1/250th seconds, rather than the J1's 1/60th limit. Mr Suzuki explains that both models are aimed at compact camera upgraders, with the difference being down to shooting style. The J is aimed at users who want a compact camera experience (LCD only), while the V is aimed at the higher-level user - a delineation Nikon has made through the addition of the EVF. This also explains the single control dial on the J; making the operation less complex. For now, the company will focus on compact camera users as the target for its mirrorless cameras. Luxury ILCs (such as Sony's NEX-7) represent a very small niche. Nikon, he says sees 'much greater potential' at the lower end of the market. Hmmm. Don't know cannot make up my mind. No decent hand grip like the P500 and others. I was excited about this product right up until the description of the interface. They almost made a great little sports shooter camera. All that best in the world speed and then controls that get in the way of anyone who knows what they are doing. Everyone is assuming this camera will be DOA because of the sensor size. Food for thought, the sensor while small is greater than 2x that of a P7000 which in theory should be nicer than my P6000 (same sensor). IMO the P7000 is a stupid camera, make it look like a Canon G by making physically larger but keep the same sensor size? This camera is about as small as the P6000 and has a sensor 2x the area of the 1/1.7". My 4x6 inch images are sharp with the P6000, I have printed 8 1/2 by 12 inch that look great (low speed and lots of light in RAW). This camera has a huge advantage over the P's. And while the megapixel arms race is done for point and shoots, Sony NEX and 4/3 formats are starting to bring format size to minds of consumers. I'll be honest, when I switched from film to digital after a long break, I knew large, medium and 35 mm format and then there was just digital, sensor size? I don't like the price of the 1's but CX size just might work, the proof will be in pics. I agree. While I also was first shocked because of the small sensor, I think Nikon did well to find their own niche in respect to micro4/3, Sony and Samsung. Well, and Pentax Q (but which rather seems to be a toy). It'll be interesting to follow the developments, but I'm conviced the Nikon system will be accepted fine (maybe only after some time). Thank you DP Review for your followup article. The camera system is DOA. Nikon has gone a long way down from the glory days of the F2. I unfortunately will purchase a Panasonic or Olympus or wait to see what Canon plans the offer. As I mentioned in another post, the goal is to make something truly better than the competition. where are the f1.4 lenses, gimme some fast 35mm or 28mm at least! Anyway, all I need is for the Nikon 1 system to have a 35mm or 28mm faster than f2.0 and I'd be set! Don't forget the crop factor...it'll be worse than the 1.5x of the DSLRs, so a 35mm will not act like a 35mm that you're used to. As for the price? Yes, that's $200 more than a high end pocket, but this has 3-6x the sensor size and accepts interchangeable lenses. If you guys actually cared about the price, Samsung would not be an also-ran. If you guys didn't care at all, then the Fuji X100 would be commanding $2000 on eBay. Neither are true. Instead the mirrorless in the $600-800 kits are the only ones selling in numbers that don't scream to Nikon and Canon as being a niche (and in Canon's case, they need to scream a bit louder). Nobody is buying a mirrorless with external optical viewfinder. That's why even the V1 has the viewfinder integrated. By the way, I voted with my $. I am a Nikon photographer, but also own/owned a Leica M8 (retro styling and quality lens selection), Olympus E-P1 and E-P2 (enthusiast ILC with anti-shake), and Sony WX1 (processor features). My vote was counted, but I was outvoted. I learned to deal with it, you should too. If a lot of you people griping would vote with your dollars instead of your mouth, Nikon would have come out with a camera you wanted. Want a mirror less with enthusiast friendly controls and a grip that doesn't cost $? Buy an Olympus E-P3. It isnot what will make a dSLR user to fall back on these toy cameras. Nikon wanted to bridge the gap between the 4/3s sensor and the compact ones (1/1.6"). If they will succeed we will see in the near future. The compacts have come from acceptable IQ to appalling IQ. That drove a lot of users that don't want big sensors into mirrorless offerings (Olympus, Panasonic, Sony and Samsung). Certainly there is a market but the price I consider too high as it was the case with the first m4/3s. Unfortunately the gallery it is not very well done but the IQ seems amazingly good. Pity that Nikon Lenses - with the F mount - will probably not be worthwhile on this body with such a small sensor. The Sony Nex is closer to the mark with an APS sensor. I passed on the 4/3rd system since it was a bit smaller than the APS sensors that Sony and my Nikon digital SLR's use. What I am hoping for is a full frame mirrorless body that lets me use the dozens of great lenses in my collection. In the meantime the Nex-5 is the best game in town for a collector who enjoys using his old glass. Maybe someone at Nikon is starting to smoke seaweed, instead of making sushi with it. Salespeople, will either try to sell you a bigger sensor, and talk you out of it, or they might push it, if they offer some kind of bonus commission for the staff selling it. Hard to say really, but we ALL expected something better than a TOY sort of micro 4/3rds, with TOY lenses. What were they smoking? is right! Too Funny! But don't worry, they already have the improvement model in the works, I'm sure. well, what nikon did recently, they really came out with something like testing ground first, then the real one will come out, for example the P7100, they really responded from the crap of P7000. So just hope for the better quality image n videos, more pros lookin mirrorless camera to come out, expect for the PSAM dial to be put out. Nikon is going to be very disappointed. This vastly expensive and rather ugly camera is most unlikely to appeal to current compact camera owners who seriously want to upgrade. It might just appeal to the empty heads who have more money than sense, and who want to cut a dash by flaunting the newest thing on the market, but for a few hundred dollars more, dedicated show-offs could buy a Leica - the ultimate fashion statement - and have done with it. To be fair, the camera incorporates some impressive technology, but my goodness buyers will have to pay through the nose for it - and at a time of economic recession, too. I can't help but feel that with this one, Nikon has scored an own goal. I have to say that I'm disappointed. I really had hoped that Nikon would come out with a true alternative to SLRs. Something with a DX sized sensor at least. But I understand that the market is what has driven their decision to give us an entry level interchangeable lens camera instead. That said, I have a sneaking suspicion that in reality, this was not so much an attempt to introduce a new camera as a means to getting a new series of lenses and accessories onto the market for testing before introducing a real camera to go with them. I of course have to reserve judgement about these cameras but a few things went through my mind before these cameras were announced. Firstly I really wanted something smaller than a DSLR. The 1/1.7" cameras really appeal. But the noise is a bit high and the dynamic range could be better. 4/3 beats the tiny sensor on noise but not dynamic range. So it seemed possible to me that some can build a camera sensor of intermediate size that would get near 4/3 for noise but beat it for dynamic range. "For now, the company will focus on compact camera users as the target for its mirrorless cameras...Nikon, he says sees 'much greater potential' at the lower end of the market." But they ain't going to pay what you're asking for Mr Suzuki! Glad he thinks £600-900 is money a compact upgrader would be cool to cough up for, since c£400 seems to be the current lower-end (and 1st gen mirrorless which starts sub £300). They're going to go to Oly/Pany/Sony for similar size body/bigger sensor (which the shop assistants are going to recommend) and either cheaper at it or better value for the same cash, to boot. There are enough down market cameras out there. Nikon should have made an affordable digital rangefinder. They would have had that market all to themselves. Fuji, Zeiss are you listening? No wonder a lot of people are disappointed: They are NOT compact camera users! Go guys and gals, this camera IS NOT FOR YOU... move along now and invest your $ elsewhere. "Nikon, he says sees 'much greater potential' at the LOWER END of the market." LOWER END: That nails it for Nikon. I am a compact camera user (S95), so presumably this camera is "for me". And at $899.95, Nikon is kidding themselves. My S95 was about $450, and as a casual camera user, that was a lot of dough for me. I considered a low-end IL camera, but came to the conclusion that they just weren't portable enough; even the smallest pancake lens would make it too big for a "always have on me" kind of camera, although the right case *might* overcome that. So, as a compact camera user, I see a $900 pricetag and the first thing that comes into my head is "If I can get a Canon EOS T3i for $700, or a kit for $825, why would I pay $900 for an IL like the V1? I'm already sacrificing portability if I get a V1, and it probably won't stand up to the T3i's APS-C sensor..."
Compact camera users like me aren't going to spend that kind of scratch on an IL camera. Even $450 was abnormally high; most of my friends bought an SD1300, and some of them got them on sale for $100. My S95 isn't 450% better than those. What I was expecting from Nikon was at least A full frame if not larger, mirorless system with a range of fast F 1,4 lenses. with a 30MP sensor maybe and combining those pixels by 2 and 3 to create a 10 MP image with great low light capabilities. I was expecting of the shutter to be able to sync with flash up to 1/4000 for great daylight flash portraits. Lately I am enjoying film photography anyway. o yes; I was looking for an affordable, small, FX camera - that's my 100 euro Nikon FE. No more blown highlights, ever; and the menu has the best possible interface: none. Fully agree with you guys I am also disappointed about these toys they have come up with. I am not part of the market that the camera is aimed at, but I have to say that I'm disappointed. I wanted a poor man's 'Leica M9'. An all metal camera with external controls for everything, minus the FF sensor. Very disappointing. Was looking foward to something better from Nikon. A digital FM3A. Wouldn't that be nice? Buy a FUJI X100 or X10, instead. I still have my "35TI", a great piece of engineering. However, Nikon has left users of compact cameras behind, and all what they are been giving us in this field is very common, uninspired cameras. 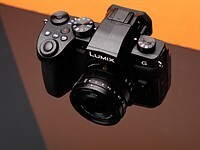 To think that before the digital age, Panasonic wasn't even in the field of cameras and now they are capable of giving us a "Lumix LX5"! Pity! But I guess I'll wait for the new X10 from Fuji to come and give it a try and hope it will live up to its "specifications". Very interesting, I might consider this. Since the sensor is 1/3 the area of DX does that mean I only lose about a stop and a half? And if I put my 300 mm bird lens on it does that make it what, like 500 mm in DX terms? At the expense of only a stop? Sounds good to me. But I am wondering,, just because the camera can capture such high speed data, aren't we limited by card write speed? What size is the buffer? as far as I can count the crop factor is 2.8x, so 300mm lenses attached to these cameras would give you 840mm equivalent. The Nikon design is tired and lazy. The whole camera body and lenses are cardboard architecture. Take a cue from the X100. How very disappointing, their advertising campaign "I am coming" should be rewritten to read " I saw, I came and I flopped". 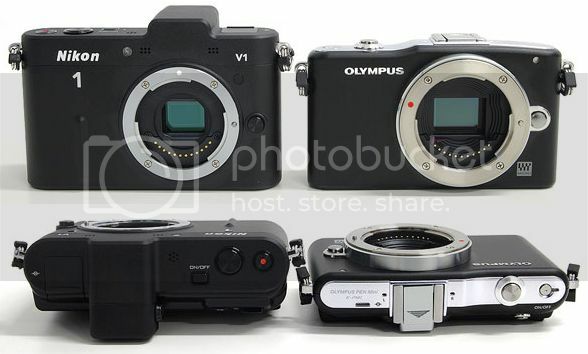 Fuji's X system and Sony's NEX system are beginning to set the standards. honestly - what is the point of a big-sensor mirrorless system, similiar to NEX, just two seconds after attaching big zoom/long tele lens to these cams? Quirky ergonomics? I personally, if only Nikon offers me a 1 system body, that ofers traditional manual controls (and is slightly bigger, preferably, then these two "version 1" cameras, am sold, immediately. First Panasonic totally screws up the GF-1 design in the successors, and now this. Frankly Olympus seems to be the only one that gives a fig about the enthusiast wanting a camera like the Fuji X100 with a little bit of lens interchangeability. What a golden opportunity this was: Nikon could have made a camera that basically takes the Coolpix 5400, (a camera CLEARLY aimed the enthusiast who either couldn't afford a d-SLRor wanted a "walkaround" alternative) and gives it an APS-C sensor (or 2x sensor like Olympus/Panasonic) and retains ALL of the enthusiasts aspects of it. Instead, like Panasonic, they are instead more interested in making mirrorless about appeasing the point & shooters rather than giving SLR users a smaller "always with you" camera that isn't a Kodak clicker. Total barf. And to think, many years ago, this was the company that gave us the Nikon SP. That's what we enthusiasts want--a "digital Nikon SP," a major refresh of the Coolpix 5400 with a larger sensor. WAKE UP! Not a popular camera to the DPReview crowd. I agree. The real question is, when will the electronic viewfinder replace the SLR view finder? I think it's a certainty that, at some point, the electronic viewfinder will be the professional standard. You're taking an electronic photo anyway; an electronic viewfinder could let you see the effects of exposure, ISO, color and, in general, provide a better photography platform for serious photographers. I believe it is inevitable. Sorry, but Nikon can only dream of a niche market the size the Nex-7 is creating. Yes, the ones are a nice size and simple to use. The AF sounds good, but the Nex-7 is no slow poke in that regard. They are headed right into the teeth of not only the new Nex market, but the whole m43 market as well. Why did they not just go m43 and at least have the best sensor and fastest AF? And of course they missed the greatest coup still left for the taking: a Cheap M9. I'm a little baffled by these little cameras. The price to value ratio is strange. I do like the actual body size, but the sensor size is a no go for me. Also the new lenses seem to be fairly limited and represent the lower end market. If consumers are to invest in a new entire system that initially doesn't reveal much forward thinking I would feel that this in itself is a costly risk from a marketing standpoint. It looks as if they are releasing a product to compete in the mirrorless segment, but already other's have done so much more for less money. The one positive that I think we can take from all of this is the data throughput advancements. Whenever Nikon and others get back to building DSLR sized cameras with or without mirrors we can expect a lot more out of them in terms of fps and resolution. I liked the pictures...looks like a nice item but does this sound reasonable? From the review: "And, if the company's market research is correct, there's every chance this market sector's expectations are very different from those of the enthusiast photographers who are currently scratching their heads and expressing their dissatisfaction about the new product." Really? At the price point of these cameras, even with just the kit lens (never mind specialty lenses) it seems to me that only a serious enthusiast would ever lay out that much money for any camera. But a point and shoot upgrader with that much enthusiasm might be hard to find. Especially with the plethera of options in the market right now. The pricing is baffling, I'll agree. I'd be amazed if they sell anywhere near those prices. They probably could offer a larger sensor in the same size camera for roughly the same price. Nikon's explanation is just spin meant to hide their true motive of protecting dSLR sales. All in all baffling and disappointing. "For now, the company will focus on compact camera users as the target for its mirrorless cameras. Luxury ILCs (such as Sony's NEX-7) represent a very small niche. Nikon, he says sees 'much greater potential' at the lower end of the market." It used to be that companies such as Nikon would have their premier products for those who needed it and as a show piece of their state-of-the-art technology and engineering know how. In return those advanced users would recommend and lead the general user community to their simpler and more fitting products. As a long time Nikon enthusiast who requires a small, light, and quiet platform for some of the event photography that I do, I now look to the Sony NEX-7 and lens adapters to fit my variety Nikkor lenses. I welcome this concerted effort to project serious photography into smaller sensor sizes. I still look forward to further development of enthusiast level cameras at these sensor sizes. I look forward to Sony and Fuji becoming the kings of serious cameras for serious photographers while Nikon, Canon and others roll around on the floor feeding mediocre cameras to the masses. ...always nice to see a comment from a fellow FZ30-er, looking for some TRUE developments in that field, huh ;)? And we DO know that reasonably small sensor are at least theoretically quite possible to make small, but fast lenses for them. Compromises, compromises... I am definitely happy with the developments here - now, Nikon, pretty please, give ma a better - handling body (could be in a year, I am not in a hurry), and a bright superzoom lenses. And you have my business, and my Panasonic FZ30 will finally go & get some well-deserved rest. Nikon limited the potential and performance of these cameras as to not errode their DSLR lines along with all those lenses. For me, I find the NEX-7 far more interesting and will probably purchase one of those. It's gonna come down to the Nex-7, a possible new version of the GF1 and maybe something new from Fuji. Sony's great advantage is that the Nex-7 already exists. Too bad about the lens choices. What are they smoking now in Japan? People want their slow zooms glued to the tiny camera. Why bother bringing out the same thing with fiddly bits (sorry, interchangeable lenses) you can take off and put back on again if the camera you've already got takes the same pictures with the same small sensor and the same slow zoom? All this in the face of Sony's NEX7 which will be the standard to follow. I'll bet Nikon shareholders are furious. 1. The sensor is just 50% smaller than 4/3". So not much compromise on picture quality. 1. 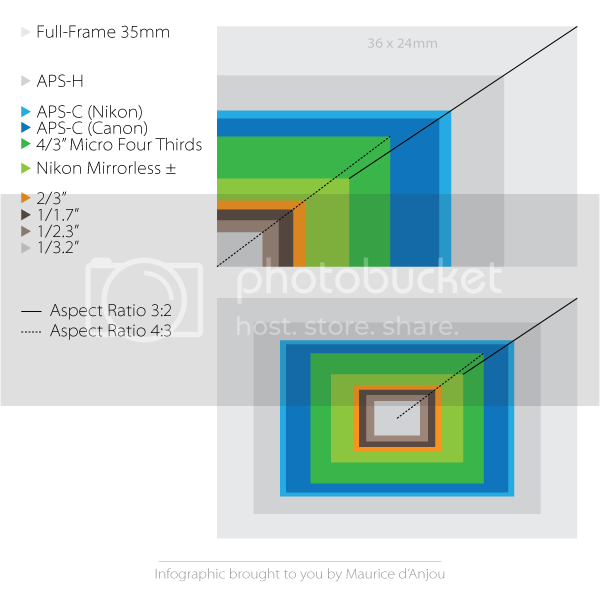 4/3" sensor is already as small as most dSLR users would accept in a compact mirrorless camera. 2. Nikon 1 line is so similar in size to PENs, GF3, NEX etc. that it does not offer any advantage in size. Also, its less than 1/3 the size of the 368sqmm APS-C sensors you can get in Samsung cameras NX11 and NX100 between 270 and 380 euros (already including kit lenses). If Nikon really offers "better photos" than LX5, F200 remains to be seen. I do believe it will take photos faster, which can be of benefit for certain applications. Nice camera and teh high speed capability is impressive, but... while it may find a market, Nikon still missed the point. Their view that a high end ILC like the NEX7 "represents a very small niche" may be true today, but in a couple of years that kind of camera will severely erode the market DSLRs. Both Nikon and Canon seem to have their heads in the sand, hoping the DSLR segment will remain strong and that fully featured ILCs can be marginalized, but I'll bet you my old Palm Treo that they're mistaken. seems like these cameras pull a lot from the feature set of Casio compact cameras that have been available for 2 years. "Nikon says that its customer surveys worldwide reveal that such users value small size, ease of use, and operational speed as much as outright image quality [...]"
This makes a lot of sense. But. Not at the price point. Also, sorry, but interchangeable lenses are anything but "ease of use." If Nikon is smart enough to build P300's successor using the sensor/tech (or even release P300s) that would be a very interesting camera. I think a compact superzoom CoolPix with blazingly fast hybrid autofocus will suit these customers more than the Nikon 1 system. The price tags of the V1 and J1 further suggest to me that Nikon has lost the plot already. Nikon's idea of "lower end of the market" appears to aim at some user's need for extreme simplicity, while forgetting that lower end always relates to price. Unless they're showing up at significant discounts from their stated MSRP, this "much greater potential" may never materialize. People who would even look at cameras this price range are not going to be too ditzy to work with Sony's Nex cameras. Selling just the Nikon label may work in places like Beverly Hills, it'll be a fashion item. I remember some guy saying he didn't mind paying $500 more for the Leica name on an unchanged, re-branded Panasonic camera, cause "Its cool to whip out a Leica" Sadly, some are just desperate for attention. As for the speed and the AF, sure, I'd like that, but not on a small sensor. Cut the exchangeable lenses feature and give me a big sensor. With phase detection on the sensor chip, i'd say that Nikon is using this camera as a market test. They are obviously busy building the technology into their APS-C and FF sensors and just want to see how this particular setup performs market-wise before unleashing the real McCoy on the unsuspecting public. Of course I could be wrong. But I don't think so. I think you're right... see how much cash they can scoop up with the 'test'. Meanwhile, if you waited with buying Sony's Nex & Co, to see Nikon's answer with a less-clunky-than-DSLR system, this looks like the wait was for nothing. Even if the fancy new features will show up in Nikon's big clunky DSLR's soonish, Sony is still the only friend of travelers who need to pack light. Nikon says customer surveys revealed what compact camera users want when they consider upgrading their cameras. I believe those people just don't know what they really want is DEPTH OF FIELD, that comes from larger sensor. Nikon failed to acknowledge that in their conclusion. Maybe I'm wrong and CX-size sensor is enough but it sure seems like all too small sensor to give compact camera upgraders the new dimension they might be looking for. The taget audience of gear like this does not know about DEPTH OF FIELD and will not miss it, at least not until after Nikon has their money. As a sensor gets you larger you get LESS depth of field. Depth of field refers to what is IN FOCUS in a photo. Whatever the target sector, as soon as you see the price it kills any hope of that target sector (or any) actually buying it! For £300 its a viable alternative to the S95/LX5 brigade, but at a price above the APSC sensor packed NEX range, Nikon have no chance! I think its about time camera manufacturers realised they need to price 'new technologies' at a lower than competitor price margin to attract market share ... not charge more than a better and more proven system such as the NEX and 4/3rds in general! Until then I'll stick to my S95, NEX-3 and D5000 - something there to cover all shooting environments! You are saying, "the V1 has a mechanical shutter too. In principle this should afford better image quality to the V1 under certain conditions". Would you care to elaborate on this? I cannot see how the type of shutter employed can have an effect on image quality. And while we're at it, how come the flash sync speed is a measly 1/60th of a second when using the electronic shutter? A mechanical shutter can prevent blow out on very bright objects. The shutter sync is the same issue as mechanical: the shutter has to be fully open when the flash fires, not moving as a narrow band across the frame. For an electrical shutter this means all the pixels must be gated "on" when the flash fires, something that it not possible in this sensor for speeds faster than 1/60s. Thanks Richard. What's interesting though is that my old Minolta A1 can sync at all speeds right up to 1/16000th of a second, and that shutter speed is almost certainly achieved with electronic gating (there's no focal plane shutter in the A1 and I do not think there's a leaf shutter that is capable of that kind of shutter speed, so it must be electronic). My old nikon D70 also combined both kind of shutters, and thus was able to sync. at 1/5000s or so, plus i read tihs allowed the camera to avoid some nasty effect when using 1/8000s shoots, as opening was performed by the curtain but the switching off was accomlised with the sensor... best of each world, they claimed. The D70 (and D1 variants) synched at a maximum of 1/500th - by dint of an electronic shutter. Anything higher than that was achieved with high-speed sync on Speedlights with reduced range/power of the flash. It's a shame they stopped using that feature. "It's most certainly not designed as a second camera for SLR users, but rather as an entirely different type of system that users intimidated by the size and perceived complexity of SLRs can upgrade to when they outgrow their compacts." A niche market if ever there was one. Will those users who are intimidated by the complexity of SLRs really want to invest their hard earned money in a £800 interchangeable lens system? I'm not sure on that one. Guess I'll just have to wait for the new "D's" to surface sometime next year. As Nikon have now pointed out, the new 1 series isn't for me.